Jordan Belfort, The Wolf of Wall Street. Creator of the Straight Line System. Author. Business Speaker. Along the way, Belfort succumbed to some of the traps of the high-flying Wall Street lifestyle, going through a spectacular—and well-publicized—fall from grace. Taking invaluable lessons from the mistakes he made and the prices he paid, he has re-emerged as a globally recognized potent force behind extraordinary business success. 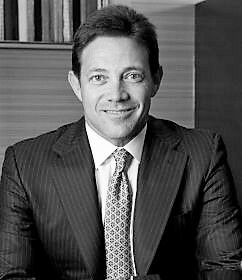 Belfort’s two international bestselling memoirs, The Wolf of Wall Street and Catching the Wolf of Wall Street, have been published in over forty countries and translated into eighteen languages. His life story has been turned in to a major motion picture starring Leonardo DiCaprio and directed by Martin Scorsese. Belfort’s experience has allowed him to develop high-quality talks on growing marketing and sales results. Using his signature direct, humorous and passionate style, Belfort will train your team on how to use the most powerful business system ever devised.